You don’t hear much about line conditioner these days, except in passing. 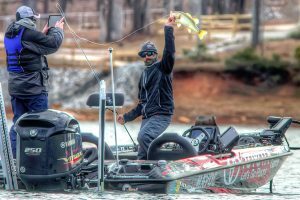 I think that’s a shortcoming in the bass fishing media because line conditioner is one of those things that can make a big difference in your fishing. Or should I say catching? In my world it has four primary uses. I always use line conditioner — my brand is Reelsnot — when I put new line on a reel. I soak a cloth in it and then run the line through the cloth as I spool it on my reel. Casting or spinning makes no difference. This accomplishes more than one thing. First, it softens the line and makes it more pliable. Second, it takes away the memory from being wrapped tightly on the filler spool from the factory. And third, it removes the “chalk” from the line that’s left over from the manufacturing process. 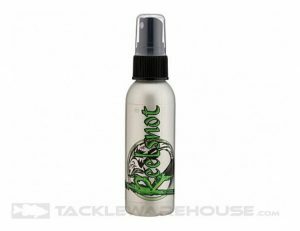 I’ve started using Reelsnot because it has several advantages over the competition. It’s relatively affordable. It only costs $9.99 a bottle. That’s cheap when you consider that it’s a pump bottle rather than an aerosol. There’s no waste. Nothing sprays out into the air. It all goes on your line. The other thing about this product is that one bottle will probably last you all year. You don’t have to soak your line and reel to make it work. A light, short spray gets the job done. Once I’ve treated my line when it goes on the spool I also use it periodically during the day. That really helps with casting distance and accuracy. The easier you can throw a bait, the more accurately you can throw a bait. The more accurately you can throw a bait, the more fish you’ll catch. Everybody backlashes. Don’t kid yourself. You might not see the pros doing it on TV but believe me when I say it’s a problem for everyone. Most backlashes are caused by trying to get too much from a cast. That problem is diminished when your line is soft and limp. You don’t have to cast as hard. Therefore you’ll have fewer backlashes. This is especially important with braid. 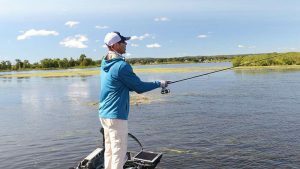 Braid has a tendency to loop over itself even when you don’t backlash, especially with techniques that require short casts or when you’re flipping and pitching. You can fix that issue easy when your line has been properly treated. The loops will drop right out. If you’re a little bit nuts like I am, you fish when it’s below freezing. Line conditioner will keep your line from freezing on itself — line freezing to line on your spool — and if you spray some on your guides it’ll help prevent ice buildup by preventing the ice from sticking to the guide. Buy a bottle of Reelsnot and use it regularly. It won’t take long for you to realize you’ve made a good decision.